Mother’s Day is just around the corner, so it’s time to start planning surprises (or dropping hints!). 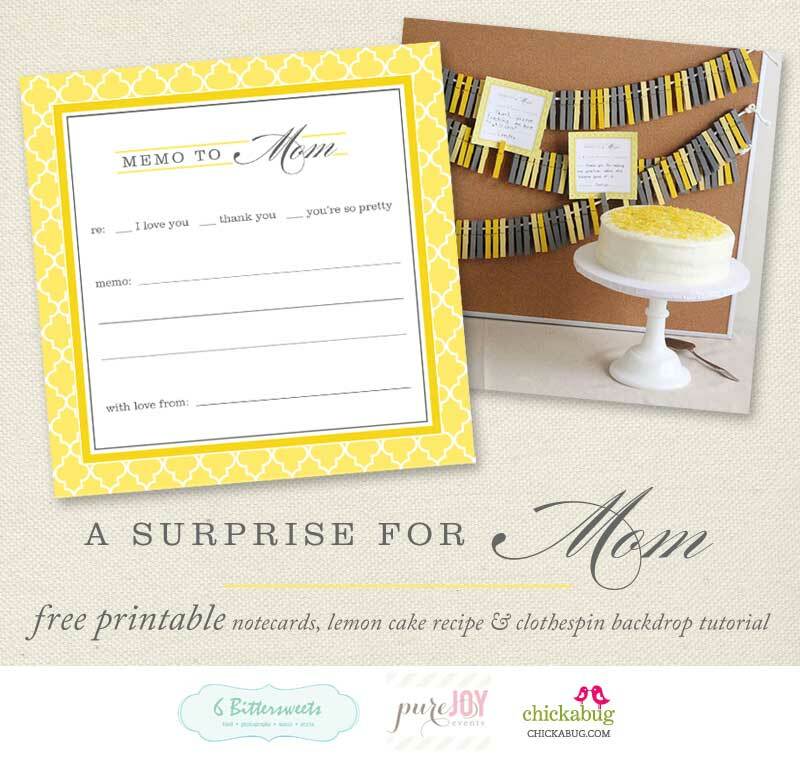 Perhaps a lovely homemade lemon cake, hand-written notes from the children, and a stylish backdrop display inspired by Anthropologie would be just the thing to make Mom feel special! 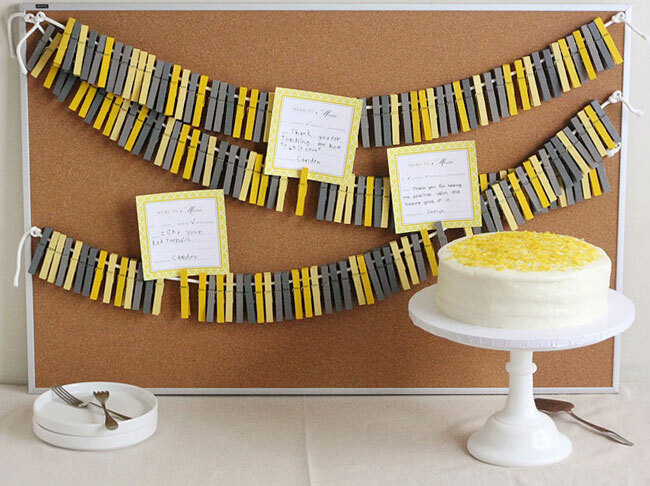 This project was a joint effort: Christine from Pure Joy Events created the yellow and gray clothespin backdrop, Xiaolu from 6 Bittersweets made the lemon layer cake and took these beautiful photos, and I designed the free printable “memo to mom” cards (which you can download below). Let me tell you, it’s such an honor to be able to work together with such talented women! I’m also thrilled that Christine has generously offered to share her tutorial for the painted clothespin backdrop here on my blog. 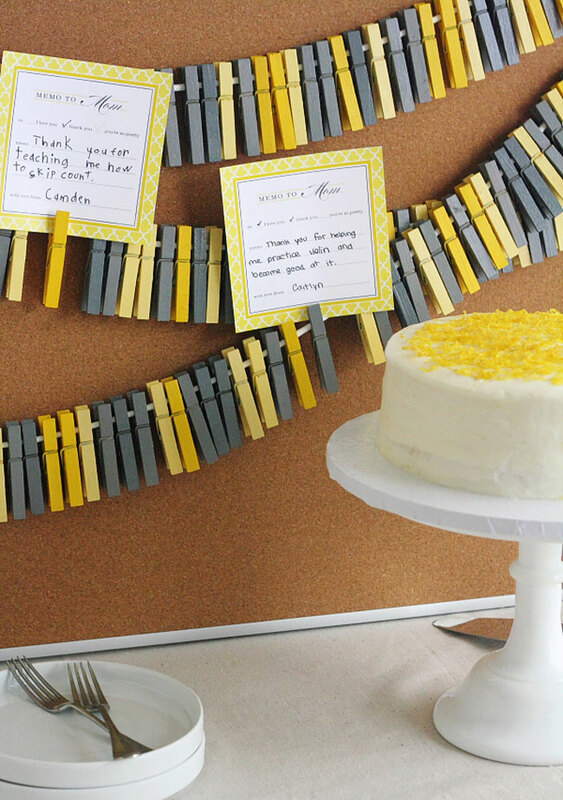 It’s such a fabulous idea to take something as simple as clothespins and turn them into something so chic! 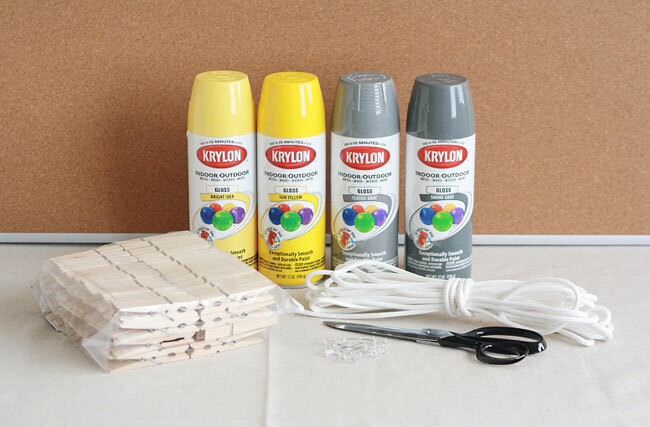 Spray paint the clothespins (50 in each color) according to directions on the cans and allow them to dry completely. Cut 3 42-inch pieces from the clothesline. Clip on the clothespins, leaving about 5 inches of clothesline on both ends. Push the pins into the cork board, then hang the clothespins by tying the clotheslines around the push pins. Let’s not forget the cake! 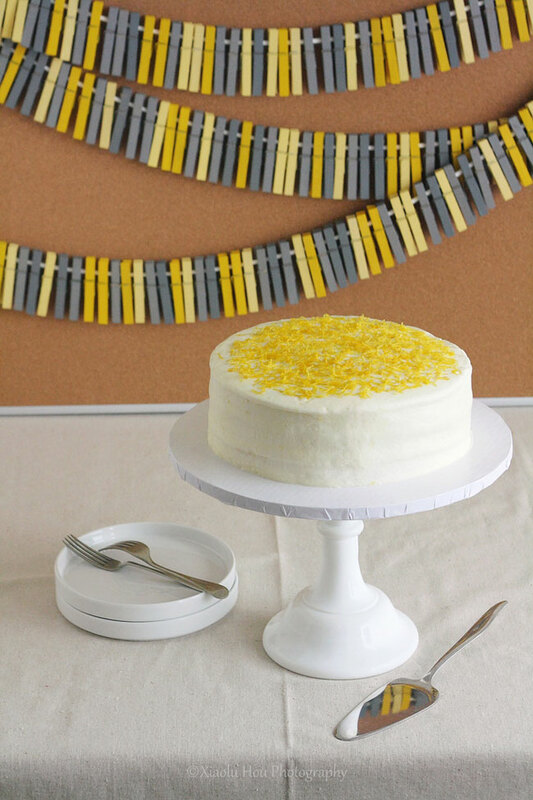 Xiaolu from 6 Bittersweets has shared the recipe for her beautiful and delicious lemon cake on the Pure Joy Events blog. With layers of light lemon cake, fresh lemon curd, and a cream cheese lemon buttercream frosting, this cake is divine. Get the recipe here. And now the printables! 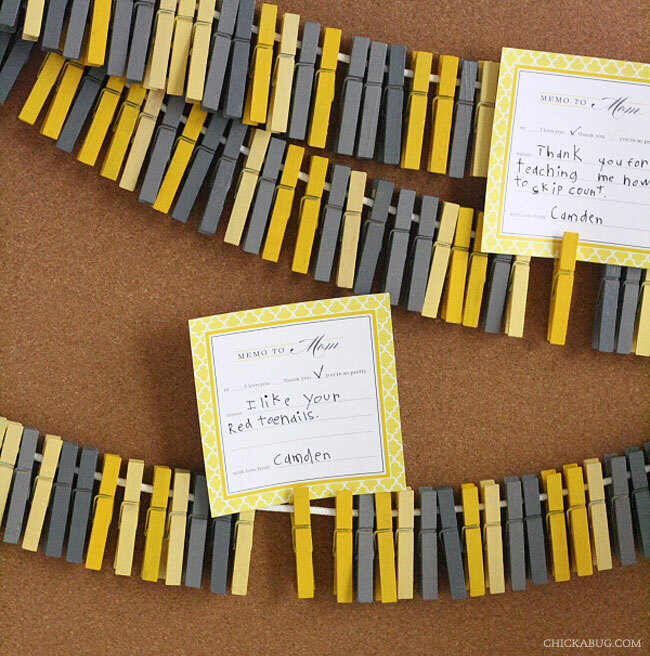 I designed these little cards in a cheerful yellow and gray palette that perfectly matches the colors used in the clothespin backdrop, and they’re a simple and sweet way for kids to let Mom know they care. You can download the free printable (which also includes printable versions of Christine’s tutorial and Xialou’s lemon cake recipe) right here. ooh, I like how the clothes pins are meant to hold messges, haha lightbulb! Such a great idea. Nice work ladies! Thank you Debbie! Christine from Pure Joy Events gets all the credit for bringing this project together. She's super creative AND a good coordinator! Heather, you'll have to join us for the next photo shoot and "taste test" Xiaolu's sweets for yourself. Always fun to collaborate with you both! You did an AMAZING job with the printable, as usual. So much fun and can't wait to work with you and Christine again soon 8). Aw you are too sweet, Heather! Seriously feel free to join us next time <3. 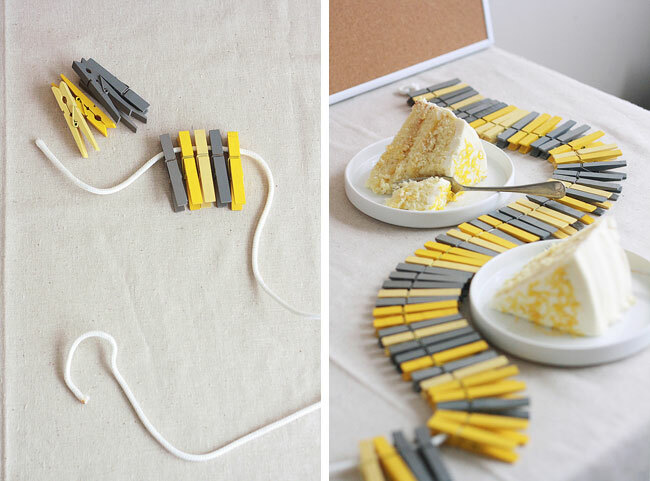 The Clothespins are such a great idea and nothing I would have ever thought to do! and has so much impact! Great collaboration from all of you, loving the colors and the printable!! This is awesome! So creative and unique. I love the color choices. Thanks for sharing. What a great idea for Mom, graduation or just everyday ordinary events. Each family member can use a specific color for their notes! I love this idea! Love that clothespin banner! Wouldn’t it be great for a back to school party? I think the link may be broken?? love the clothespins--super inexpensive way for me to display my children's art in the play room! thanks for the great idea!! Beautiful idea! we are wanting to use this idea for a co-worker retiring - wondering if you could provide template that could be adjusted for this use? Now hooked to your blog! Best idea ever for an event decoration! Even for teachers that want to display their students school work. Awesome tutorial :) Thanks for sharing!